Little Caleb Farley was the first baby born at Emory University Hospital Midtown on Jan. 1, 2013. Mom Tirreyon Norfleet was thrilled to ring in the New Year with her new baby boy. He was one of 13 babies born on the first day of 2013 at the hospital. 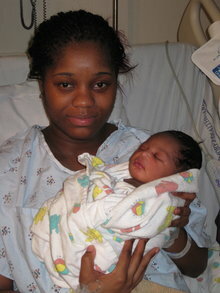 Emory University Hospital Midtown’s first baby of the New Year was born at 6:58 a.m. on Jan. 1, 2013. Little Caleb Farley weighed in at 7 pounds, 4 ounces. Proud parents Tirreyon Norfleet and Calvin Farley are excited that their baby’s birthday falls on New Year’s Day. “His due date was January 6, but I just knew he would come earlier,” says Norfleet. Caleb is the first born to Norfleet and Farley. Mom, dad and their new bundle of joy are resting and recovering nicely. Ironically, 13 babies total were born on New Year's Day 2013 at Emory University Hospital Midtown.